It was the most rewarding and also the most terrifying drone experience yet. Flying in Iceland is no joke. You have extreme weather, howling winds, and birds! More on the birds later. Here are my top 5 that will make your drone footage easier to obtain and more captivating. Tip #1. Go off the beaten path. One of the first things you will notice are the "no drone" signs at the major attractions. When we first arrived we hit the Golden Circle, which is the most popular driving route near Reykjavik. 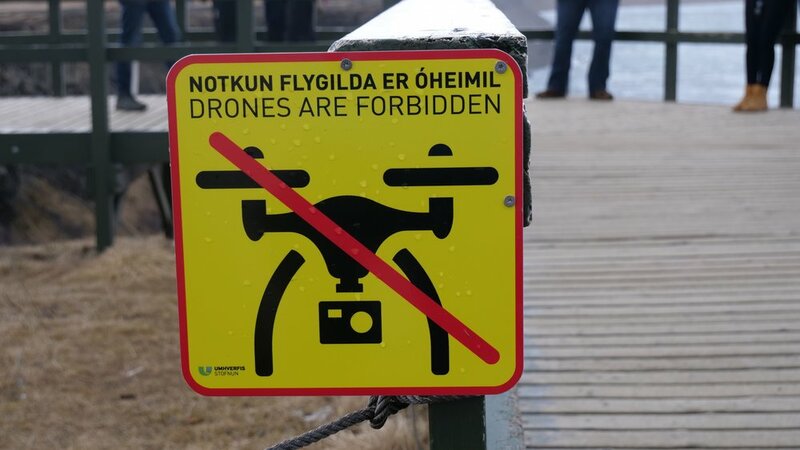 Arriving at Gulfoss, Icelands most famous waterfall, I immediately saw the bright yellow sign stating "Drones are Forbidden". Wow, was I bummed. With the rise in popularity, ease of access, and pricing of drones these days I am sure the hot spots of Iceland would have a constant hum in the air. So be a responsible pilot and obey these rules. Remember, you are a guest and I always advise tourists to respect the local culture, land, and laws. So my #1 tip is to explore Iceland and find unique places to add to your aerial portfolio. Trust me there are loads of beautiful locations with very few tourists. Once I accepted that I wasn't flying at the famous sights, I started to find drool worthy locations all around me. Find a hidden gem and go fly. Tip #2. Go early or late to avoid crowds. During the summer you have a ton of time in the daylight. The sun only sets for a few hours and it never get completely dark. My favorite time in Hawaii is what I call "golden hour" which is usually from 6pm to 7pm or the hour leading up to sunset. In Iceland that golden period lasts much longer. I noticed it was perfect light conditions from around 9pm to 12am and then also 3am to 6am. So as you can imagine there are far less people in those odd hours to ruin your shot. We came upon Svínafellsjökull Glacier at 4am and flew over the glacier as the sun just peaked over the mountains. I couldn't have timed it better. Tip #3. Be weary of wind and birds. Wind shouldn't be much of a surprise. Iceland is a volcanic island in the middle of the Ocean. However, what caught me off guard was how quickly it changed. I would power up my drone thinking it was the perfect moment to fly but suddenly a gust of wind would nearly knock me over. So be patient and wait until it's safe to fly. The Island is so diverse that driving an hour could put you in ideal conditions. Check en.vedur.is for up to date weather information. Now onto BIRDS. These guys nearly gave me multiple heart attacks and left me with some form of drone anxiety. At almost every location they would dive bomb my drone and swarm in large numbers. I'm not even sure what type of birds they were but they were extremely aggressive and territorial. Once they got so close that it set off my "avoid collision alarm". Luckily we never collided but I assume if I had spent more time with them it would have ended bad for both of us. So tip #3 is to wait for light winds and avoid areas with a ton of birds. If they come find you, which they will, cut your losses and head back for a quick landing. I flew out to remote waterfall and once I got close birds started attacking. I high tailed it out of there and headed back in Sport Mode as quickly as possible. As I came up to land, confident I had out ran them, there was a flock of birds still trailing my drone. These guys are mean business. Tip #4. Spend more days than you think you need in Iceland. Nearly every local we met apologized and complained about the weather during our week visit. They are claiming it's the worst Summer in the last 100 years. Luckily for us we only had 2 or 3 bad days out of our 7 in Iceland. But the bad days consisted of high winds and rain all day long. This meant no droning. Even if we had a perfect week of weather I still would have wanted more time. I felt like I was filming constantly and when I got to the editing bay I realized I wanted more. Iceland is so massive and every piece is so captivating that I found myself pulling over and filming every mile or so. Trust me you will want more time here than you think. We were there for 6 nights and 7 days but I feel you will leave more satisfied with 11-12 days. Next time I won't be cutting it short. Tip #5. Create dimension and thoughtful framing in your footage. If you are familiar with capturing quality drone footage you will know that what looks like could be an amazing drone shot doesn't always end up looking quite as spectacular once you pull it up at home. Large sprawling landscapes are difficult to capture with a wide angle lens and Iceland is one massive landscape. Creating some form of dimension in your footage makes for a much more complete image. Try to have something in the front, middle, and distant parts of the image. This isn't always simple to do but once you get an idea of what to look for it will come easier. Finally, think of your framing. Drone photos catch your eye when they are framed in a pleasing, sometimes symmetrical manner. I also am a fan of having a subject in the foreground. Whether it's a person, vehicle, or object I feel that it tends to catch the eye a bit better. My suggestion is to study popular drone footage and see how they utilize negative space and framing to create a well rounded image.